It all started in 2005. 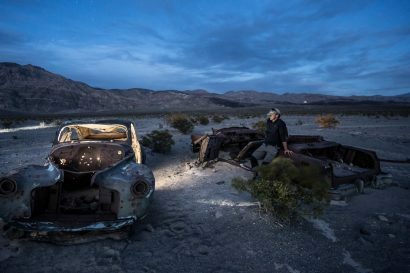 After spending months researching which North American vehicle would be capable of taking us around the world, we came to the conclusion that there wasn’t one. We started to outfit a fj62 in the US but eventually realized that it was not going to cut it. 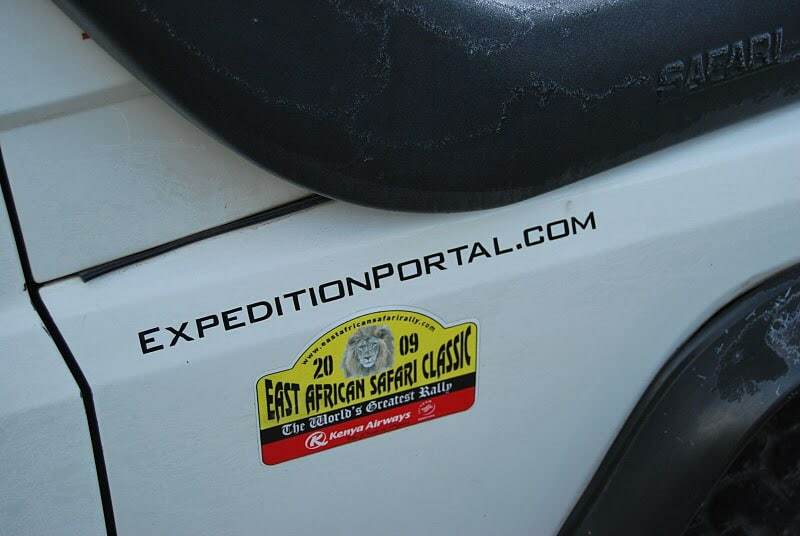 Once loaded with the roof top tent and all other gear, we were lucky to get 12 mpg…. Since my first assignment in West Africa, I had always considered the hjz75/78, also known as Troop Carrier, as the ultimate expedition vehicle. Realizing that it wasn’t possible to get our vehicle of choice in the US, we adopted a different strategy. Let’s just start the trip elsewhere, somewhere where we can buy one of these…like Australia! The first portion of the trip took us to New Zealand from where I started scouting the Internet. 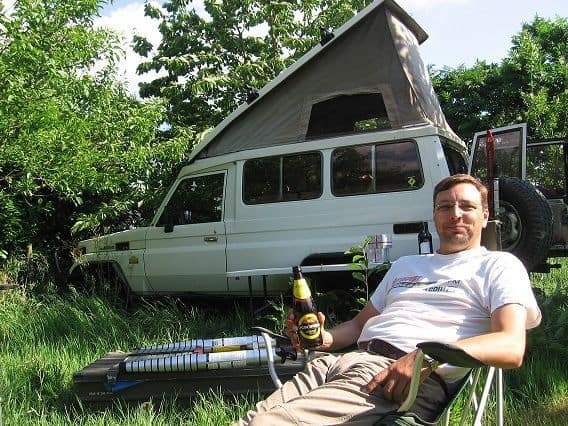 I eventually found a 1988 hj75 with a pop top, a la Westfalia. After landing in Sydney and renting a car, we drove over to a northern suburb to look at this beauty. A few hours later, I was driving back the truck that would become our faithful companion for the next 5 years, taking us to places I could only dream of. This model came with everything we needed for the journey: a factory snorkel, 2 fuel tanks (180 L total), a beefed up suspension, 2 water tanks under the frame, a stove in the back door and a double bed upstairs. Everything was really basic but extremely robust. The next day we were on the road and we spent the next 3 months exploring Australia. We drove from Sydney all the way up to tip of Cape York, and then right across the Outback from Cairns to Perth. All of that without one single issue, no spare parts and only very basic tools. The first journey took us from Durban to Mozambique, then Botswana and then back to Pretoria, where the truck would be in storage for several months, thanks to my friend Jan.
For the following trip, we spent several weeks exploring the coast, from Johanesburg to Cape Town, including Lesotho and Zululand. 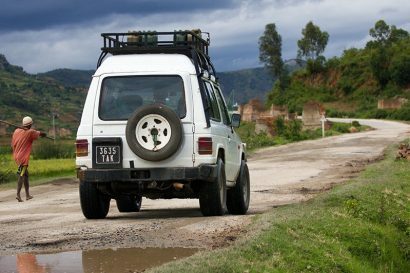 Finally, in 2009, we returned and accomplished the ultimate goal: we drove the faithful troopie from Cape Town to London, covering some 40,000km, 23 countries and 9 months of daily use/abuse. The initial expectation was to bring the truck back to Canada with us. However, due to a change in regulation, I found myself unable to import it. Sadly, we would have to part with our trusty companion. A few postings on the internet and the new owner was found, a guy named Matthew who lives in Gent, Belgium…and promised to take her on new adventures…. Matthew has not only been a great buyer, he’s also become a good friend. 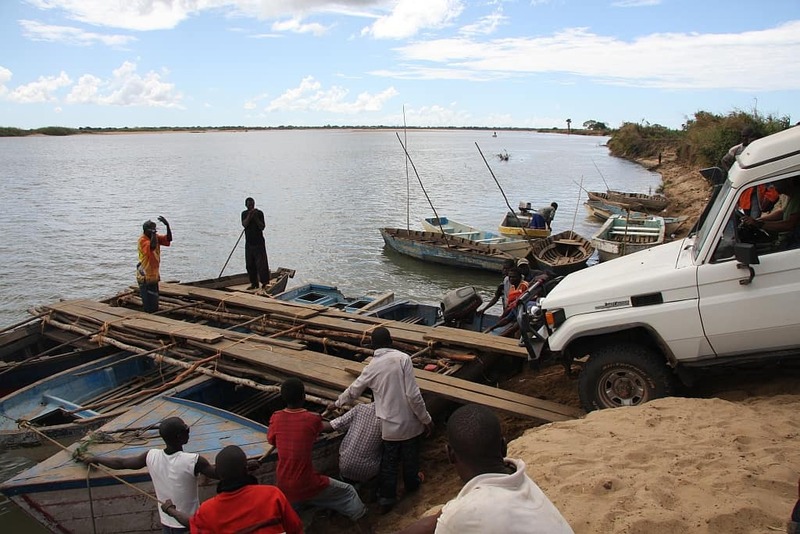 I literally dropped at his house with the truck freshly covered in dust from Ethiopia and the inside looking like an hurricane had gone through…the last miles had been pretty rough on the truck and its crew. I knew after the first long bike trip, traveling 2 up on a motorcycle with camping gear wasn’t going to be easy. 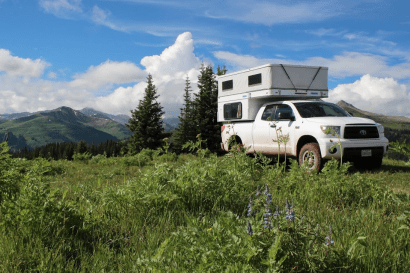 It was time to look for a 4 wheeled overland vehicle. After hours of reading Overland travel reports; I had decided the main criteria was to be able to sleep inside. A good night’s sleep is crucial. 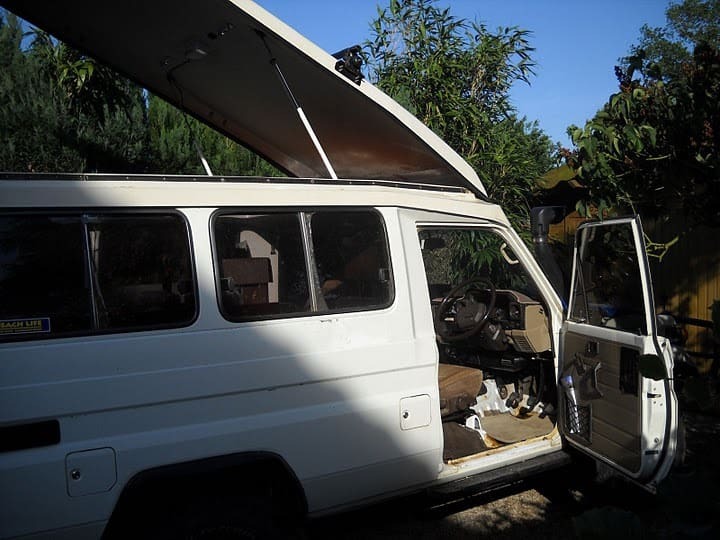 A roof tent didn’t do it for us, so I started looking at converted vans…. 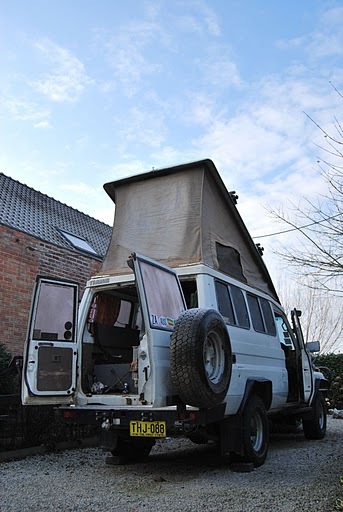 They offered the accommodation space but lacked off road capabilities, I remember pulling a 2wd camper out of a parking space once, after heavy rain !!! We would travel independently and fitting the vehicle into a shipping container would also be a big bonus. So my mind was made up a 4×4 with pop-up roof. The “nice to have” accessory list soon grew, extended fuel tank, on board water, separate heater, heavy duty bumpers and spare wheel holder. At the same time the previous owner of a HJ75 with registration THJ088 had finished touring Australia and had shipped the car to Cape Town where he was planning on driving north to Europe. Due to a change in Canadian law, he was unable to ship the car home forcing him to sell it. 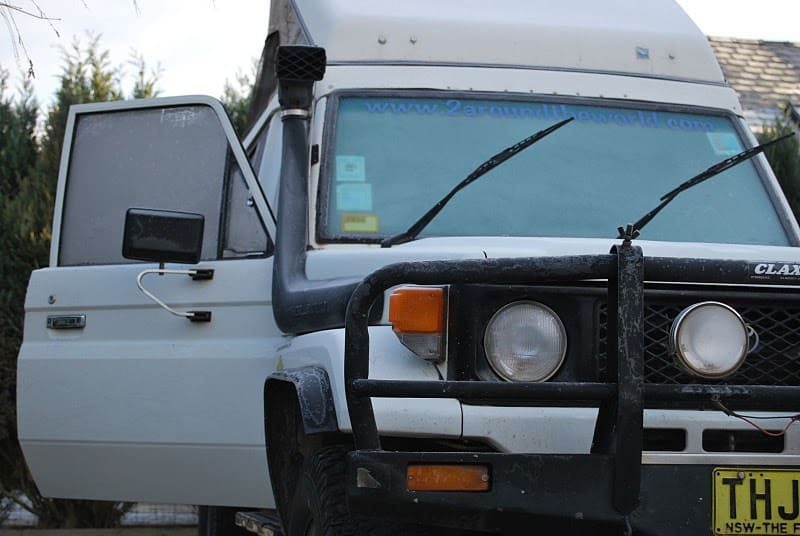 After many emails a deal was struck and I became the new owner of THJ088, a legendary 1988 Toyota Land Cruiser HJ75. 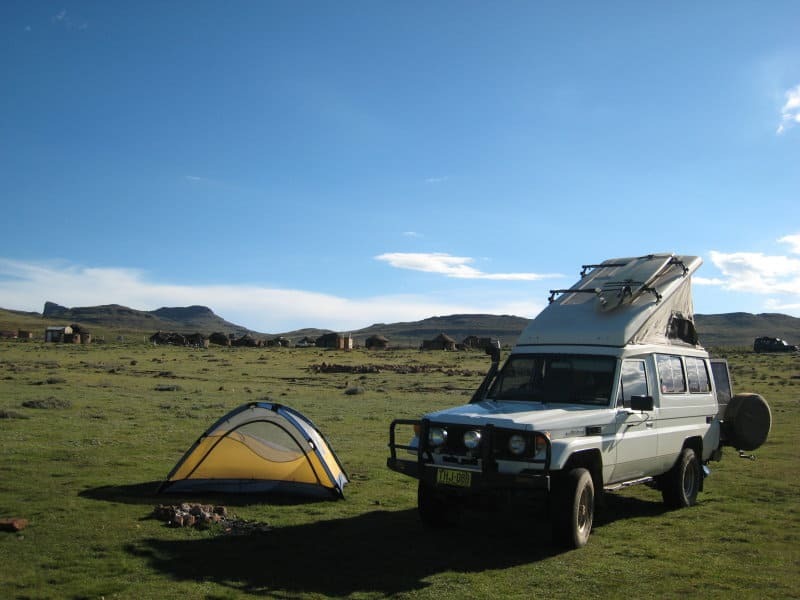 THJ088 was modified by Trekker of Australia into an Outback back expedition vehicle. Its modified with factory fitted auxiliary fuel tanks totaling 180 liters, additional hot and cold water system, Pop-up canvas roof with fiberglass shell and ARB bull bar. The previous owner had the forethought to install a Extreme Outback dual spare wheel carrier when in SA. 22 years later and 300.000 kms of Overlanding – she’s ready for some TLC. In fairness THJ088 is in excellent condition, the first goal is to import her into Belgium and complete the Single Vehicle Inspection. This includes fitting a rear fog light, European approved seat belts, left hand drive head lights. Plus all the usual technical inspection issues – 22 year of driving in sand has taken its toll on the paint, on most leading edges the paint is warn back to primer or even bare metal… not ideal in this wet northern hemisphere, I can also see her rusting !! There are few rust patches that need attention and copious amounts of wax oil needs applying. A recent trip to Europe’s Allrad show in Germany has really un-nerved me, literally hundreds of pop-up Toyota’s of all colour’s and variations, now I’m ready to pull the interior and start again, all in a mission to find the last centimeter of potential storage space, for that last must have acquisition.